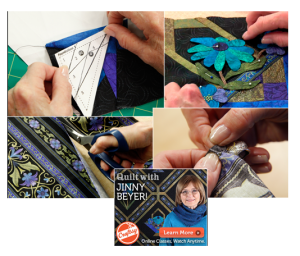 You can watch me demonstrate dozens of quilting techniques and tricks in the FREE online video classes developed for my 2015 BOM program with Craftsy. Although 2015 is long gone, all the instructional videos are still available and still completely free. To view them, you must be a member of Craftsy and enrolled in the class. I assure you that both of these are completely free of obligation or cost. And you can pick and choose what you want to view and when. For a detailed list of the lessons click on the link.